For a distinguished walking cane head to James Smith & Sons in London. The firm has a large assortment of walking canes, including an unusual walking cane: a maplewood stick with a corkscrew in the handle (£145) and another walking cane: a very smart replica of the drinking stick used by Toulouse Lautrec (pictured), made from a laminated tropical hardwood and containing two glasses and a glass flask, for £445. The firm has a long history, dating from the 1830s, in the design and production of umbrellas and constantly updates its products with advances in fabric and structure. 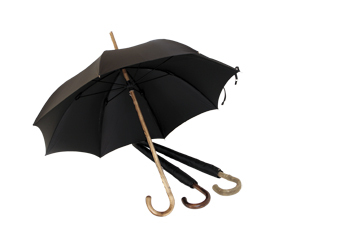 Its website shows the full range of walking canes and umbrellas, including the wooden solid stick (pictured open), £225, and the classic City. James Smith & Sons is at Hazelwood House, 53 New Oxford Street, London WC1 1BL, tel 020 7836 4731.